Gaura lindheimeri might be considered a pest if it weren't so pretty. There are a bunch of named varieties, flowers vary from white to pink, the plant size varies a bit too. Gaura lindheimeri plants will live a season or two, but come back readily as seedlings. That seed part is the potential pest part. Gaura lindheimeri grows from 1 - 2 feet tall and wide. The red tinted green foliage is primarily near the base. At the end of the season I trim Gaura lindheimeri almost to the ground. The old flower spikes are all dead sticks by this time. I have not met anybody calling these plants by any common name but Gaura. Gaura lindheimeri is not picky about soil type and will get by on a pretty stingy water diet. Gaura lindheimeri won't do well in shady sections. And yes Gaura lindheimeri does attract bees. 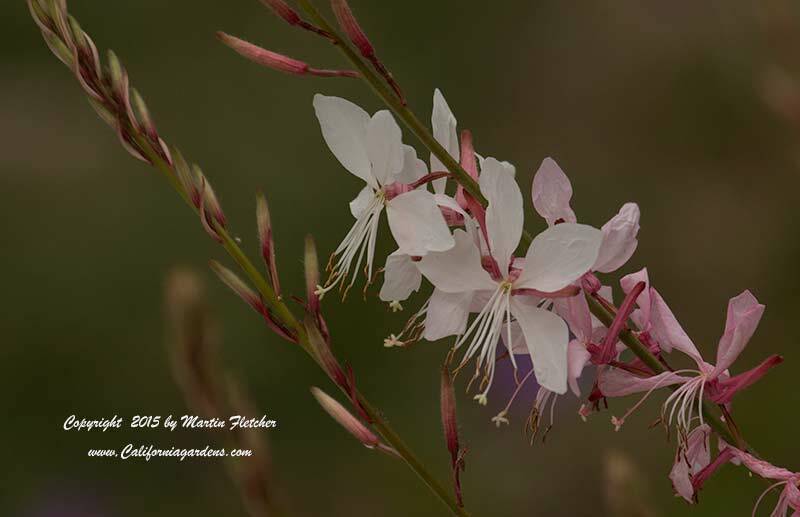 White flowers with a hint of pink of Gaura lindheimeri - Bee Blossom. High resolution photos are part of our garden image collection.